On your next Coorg getaway, drive past boring homestays and check into Coorg Treehouse instead. The OYO Rooms property promises a clean break from city life and sweeping views of Madikeri. Just because adulthood has set in, doesn’t mean you have to miss out on the simple joys of childhood, like shacking up in a treehouse. 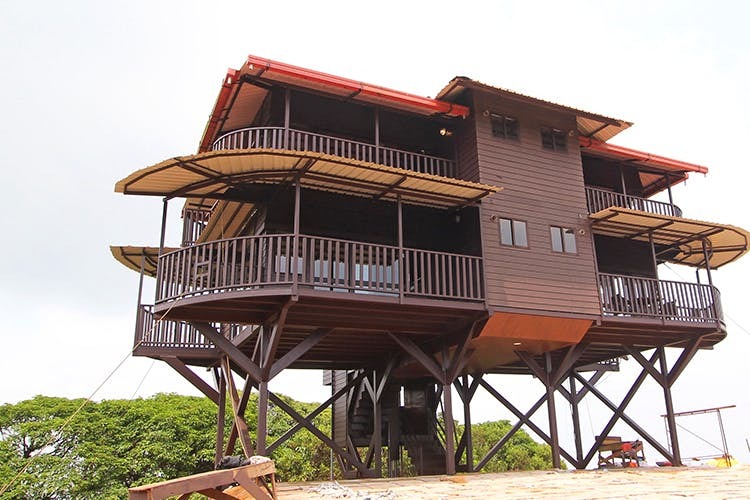 Offering you a super cool upgrade to the ones you remember is OYO Rooms, with their Madikeri property, Coorg Treehouse. Set on a hill, with plenty of trees around, wake up to stunning views from the top. With balconies on either side of your room, let easy breezes and natural light flood your space. Smack in the middle of sprawling coffee and spice plantations, cut off from civilisation, but not too far from all the sights. So make sure you hop on a jeep and head out with a camera for a fun adventure on your ride down the hill. Want to do something more indoorsy? Curl up in front of their fireplace with a good book, in the picturesque setting amidst the hills. A luxe set up, each room is nice and spacious, offering great views of the hills. Neat double beds, tidy private bathrooms, and a little kitchen, you’ll be nice and comfy here. The treehouse only has four rooms on offer, so it never gets too crowded. Especially since the framework is wood the but rest is made from glass, and gives you the impression that you’re floating! With staff on-site to make sure you’re comfortable and your tummy’s always full, you’ll be well fed with authentic Coorg eats and your rooms will be kept spick and span. Setting you back by INR 6,800 for a room for two, we think the experience is worth it. Nothing like living the high life in the Scotland of India. The treehouse is only seven km away from Abbi Falls and 11 km from Madikeri Fort,if you manage to get out of the beautiful property at all during your stay.